The Election Observer for Sivasagar and Director of Inland Water Transport, Government of Assam, Bharat Bhushan Dev Choudhury in a meeting held on Thursday evening at the Circuit House in Sivasagar reviewed the preparations being taken by the district administration in view of the counting of votes for panchayat election scheduled to be held on December 12 next. He discussed various aspects like manpower engagement in the process, training of counting personnel, security plan for the day, declaration of round-wise results, briefing the political parties on the counting process etc with the officer-in charge of various election cells. In his deliberation, he stressed on conducting proper and thorough training of the counting personnel to be engaged in the process. The officers in charge of various cells briefed the Election Observer on the preparatory measures taken for smooth and error-free conduct of counting of votes in the district. It may be noted that a training programme for the counting personnel will be held on December 10 next. On the same day, the political parties and independent candidates will be briefed on the counting process. 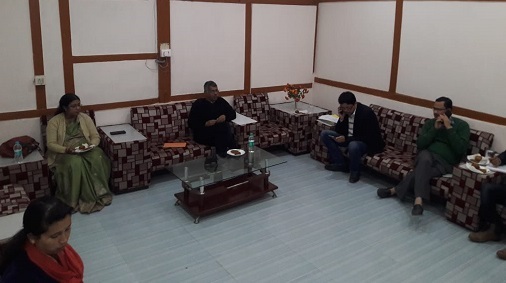 Besides, a host of other officials, the meeting was attended by CEO of Zilla Parishad Sewali Bordoloi, DDC (i/c) Nawab Al-Azhar Ali, ADC Bidit Das, ADC Ashwini Doley, Election Officer Jagadish Brahma, Assistant Commissioner Gauri Priya Deori and Finance and Accounts Officer.